Golden Bay is a holiday destination in its own right, but it also provides access to both Kahurangi and Abel Tasman National Parks. The map shows the walks and other activities and is complemented by short notes on Golden Bay's rich history. The 1:60 000 scale increases the utility of the map by acting as a geographic index of the location of the many activities to be enjoyed. A fully-detailed topographic background enhances the appreciation of the environment. This 2017 edition shows the National Park and adjacent reserve boundaries. 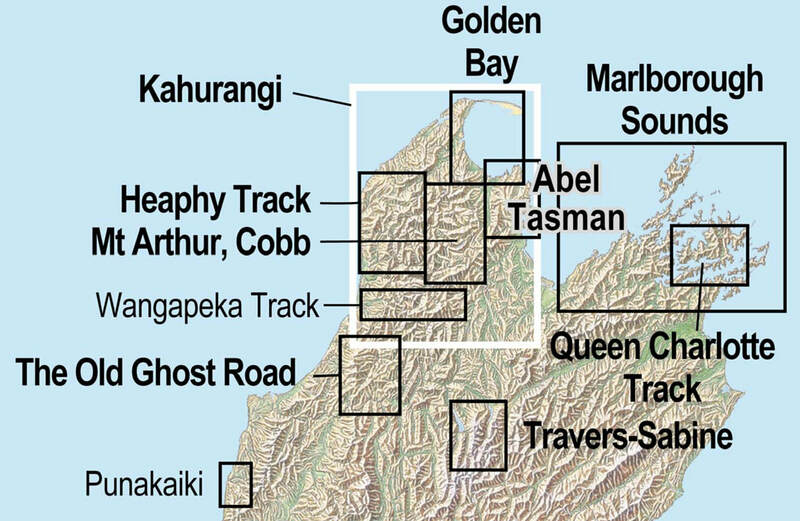 There are overlaps with the Mt Arthur, Cobb map to the south and with the Abel Tasman map to the east. Printed on 90gsm high wet strength paper.